City Index is a trusted provider, located in the heart of London with over than 30 years of experience and heavy background of well-trusted parent company – GAIN Capital, which is listed on the New York Stock Exchange, serves numerous trading names around the world and is one of the largest retail and institutional trading providers. Among the numerous benefits and transparent operation that Gain Capital shows constantly within the industry, its global presence with 800+ staff across Europe, Asia Pacific and North America are letting you trade assured of a clear manner broker operates. Investors that chose City Index as their broker comes to a number of over 150,000 traders worldwide, and this is not a surprising fact. The broker’s quality execution, competitive pricing, low margins, tight spreads from 0.5 points of FX and truly supportive relationship management makes a well-valued choice. City Index enables trading on over 12,000 global markets consisting of Spread Betting, CFD and Forex Trading for 21 global Indices, 4,500+ Shares, 84 FX pairs, Crypto and 25+ Commodities. Crypto market at City Index is also widely presented and including Bitcoin, Etherum, Bitcoin Cash, Litecoin and Ripple, with an opportunity to adjust trading strategy and start to trade as a spread bet from 10p a point or as CFD Minis. Along to the wide range of markets the broker is famous for its platform features, as well as the progressive, some of the leading trading solutions and technologies. As we will go further and find the City Index offering in a detail, you would truly understand why the broker gained during thirty years of their activity such a trustful position along to many awards and international recognition. Is City Index safe or a scam? City Index and City Trading is a trading name of GAIN Capital UK Ltd authorized and regulated trading provider by the UK Financial Conduct Authority and holds additional 8 worldwide jurisdictions registrations as a part of GAIN Capital Holdings Inc, founded in 1999. However, particularly City Index serves offices in Dubai, Singapore and Australia, while surely holding respected local authorizations by UAE Central Bank, MAS and ASIC accordingly. Since GAIN Capital Inc is one of the largest and heavily regulated providers from almost every jurisdiction, with its strong records and the highest standards of governance, the financial strength and the transparency it delivers considered to be on the highest possible level. As a retail client’s money is fully segregated from the broker funds and are kept separately safely with world leading banks. Along with the rest, necessary protection procedures that are carefully followed by the company the trading accounts and overall management of the traders from A to Z adheres to provide you with a clear state of mind. In addition, broker applied for negative balance protection and in case of insolvency FSCS controlling clients compensation to recover accounts up to £85,000. 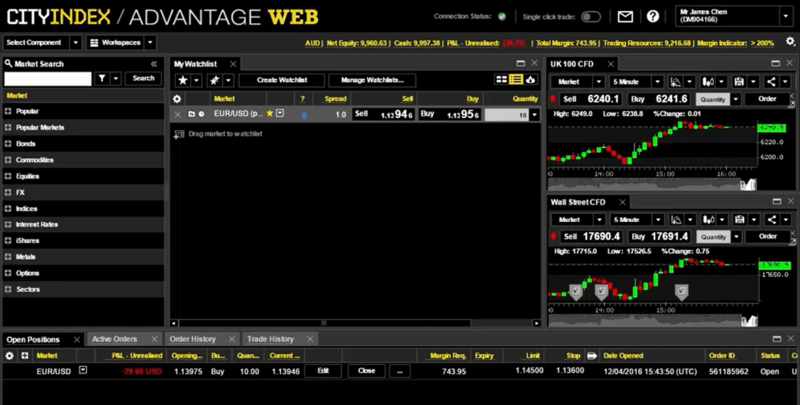 A variety of platforms at City Index covers web-based platform – Advantage Web platform, or downloadable AT Pro platform, as well mobile or tablet apps or still remains the choice to use known MT4. In fact, and what is obvious the broker’s developed platform designed as a powerful technology for whatever level of trading you are willing to perform, as it offers customizable 16 types of charts, 80 indicators and actionable trade ideas by research portal highlights. For its great performance, the platform has gained several awards for excellence and has been chosen by many traders among others specifically for its outstanding capabilities. Of course, City Index mainstay platform features various versions so you can choose either to use or access platform via various methods by the device of your choice. A highly customizable web-based platform will be a perfect choice for those who prefer easy access and powerful fundamental analysis mixed in one tool. Furthermore, the broker indeed pays great attention to the execution policy. If the price moves in traders favor while an order is being processed, City Index executes orders at the better price by their developed technology. In terms of an account management it has been done in a simple, not confusing way, meaning you can apply either for a financial spread betting or CFD trading account. Furthermore, there are options between three account types while all of them are featuring the same efficiency, utmost support and technology used, but vary by the level of the trader itself. Since traders truly diverse by the experience and then the necessity of the particular service within the offering, City Index adhered to satisfy the needs of each group. Thus, you can apply for one of the three account types: Trader, Premium Trader and Professional Trader respectively. Another interesting additional feature from the broker is Private Client Service – is a tailor-made exclusive program for active traders who fund and maintain an account balance of £10,000 or more, and it comes with highly competitive pricing, expert trading support and some interesting perks. Certainly, it is important to understand the risks involved in trading before account opening, hence the broker strongly encourages new traders to practice and educate themselves by using a demo account, also how to minimize risk using the educational tools available from the broker learning programs. City Index offers two demo accounts joint CFD, spread bet and MT4 accounts. Demo account gives 12 weeks unlimited access with a balance of £10,000, also client will be able to access Advantage Trader or MT4 mobile, tablet and downloadable platforms according to account type. For the markets and trading conditions, the broker delivers transparent pricing model and actually offers quite competitive fixed and variable spreads starting from 0.5 pips for FX or from 1 point for Indices, with margins from 3.33%. For instance, check out and compare City Index trading fees with its UK based peer Trading 212. Beyond Indices, FX, Shares and Commodities City Index offers an additional choice of markets to trade, including Metals, Bonds, Interest Rates and Options. City Index spread depending on the market you wish to trade, as well giving you an option to choose between the fixed or variable spreads according to the strategy you prefer to use. Below you can see the comparison based on minimum spread quotes, yet for most recent price check an official website or platform. In regards to additional charges, you should consider that City Index charge commission when you Spread Bet or trading Shares on CFD Trading. E.g. UK Shares are eligible to 0.08% CFD Commission with a minimum of £10. Also bear in mind the overnight fee, which is charged if you hold a position open longer than a day, financing rates are set at benchmark regional interest rate of +/- 2.5%. Leverage known as a loan given by the broker to the trader that allows you to trade larger capital than the initial capital is a very useful tool, yet you should use it carefully. Recent regulatory updates from European ESMA set a maximum level to only 1:30, as the authority recognized the potential not only magnify gains but loses as well. Therefore, the European entity is eligible to offer a 1:30 leverage only, while the Australian branch and clients still might use leverage up to 1:400. In addition, the leverage levels are depending on the account offering, while you may face a difference in margins too. City Index offers most common payment methods that will assist you to find the best suitable choice to transfer money to or from the trading account. The set includes Debit card: Visa, MasterCard, Maestro and Electron, Credit card: Visa and MasterCard, or a Bank transfer. There is no minimum deposit requirement for account opening, even so company advising to do deposit from £100 in order to cover margins. Transactions involving card deposits and transfers for both deposits and withdrawals do not incur any charges, however, if you wish to receive same day payment using a CHAPS bank transfer, there will be a £25 charge. 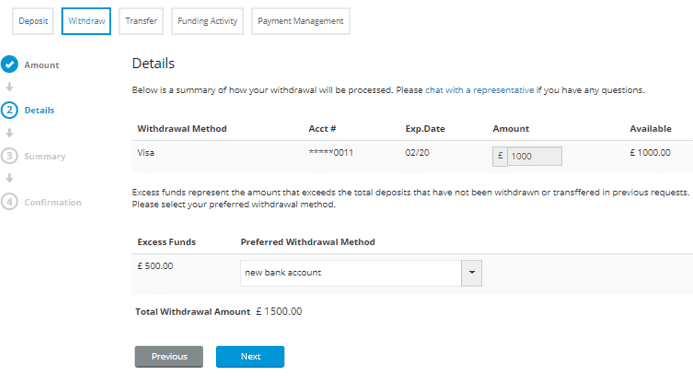 The minimum withdrawal amount is £50, while the maximum amount through a single transaction is £20,000. Please note, in case you will stop trading activity a monthly inactivity fee of £12 will be applied to accounts that are inactive for 12 months or more. Even though the payment methods are quite limited, they are in fact most reliable, as well as does not incur additional charges from you to transfer funds, which is definitely a big advantage. As we can conclude, City Index as a part of the global leading financial company GAIN Holding is not just the reliable and stable company to cooperate or trade with though heavy regulation and utmost client protection rules. But also broker that provides its clients with all necessary tools for potential successful trading either both beginners and the experienced ones. A wide range of technical optimization tools, alike highly developed choice of platforms and various instruments for analysis, strategy improvements and functions bringing excellent proposal mixture to suit your particular skill level and expectations.